I ordered this pin from GBuniqueCreations on Etsy. I have the Tee-Shirt by Chris Wahl, but It’s a great looking pin to add to my collection. 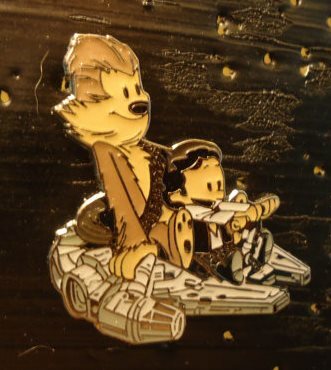 This entry was posted in Badges and tagged Calvin and Hobbes, Chewie, Han Solo, Millenium Falcon, Millennium Falcon, Star Wars. Bookmark the permalink.